How much is Mr. T Worth? Mr. T Net Worth: Mr. T is an American actor who has a net worth of $1.5 million dollars. An actor, wrestler, and motivational speaker, Mr. T became famous as a wrestler, but achieved worldwide success as an actor. He played B.A. Baracus in the popular television series, "The A-Team", and starred in Rocky III. He was also the subject of a reality show entitled, "I Pity the Fool" in the late 2000's. Born Laurence Tureaud on May 21, 1952, in Chicago, Illinois, he is best known for his role as B.A. Baracus on the 1980′s show The A-Team. Prior to entering the limelight, Mr. T spent short period playing football at Texas A&M Prairie View, after which he got back to Chicago to become a bouncer. At this time, he adopted his signature hairstyle and sported gold chains to reflect his reputation as one of the toughest in Chicago security. In the process, Mr. T made some high profile connections and was hired as a bodyguard for several celebrities, one of which was Sylvester Stallone. The life changing meeting with Stallone helped Mr. T to land a part in the 1982 drama Rocky III as Rocky Balboa's rival. This turn was followed by other roles, as well as Mr. T went on to produce his own cartoon series called "Mr. T's Commandments" that encouraged young people to make positive life choices. 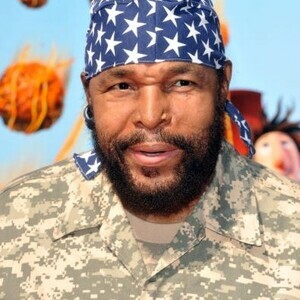 Unfortunately, his battle with T-cell lymphoma in 1995 forced Mr. T to withdraw from the public eyes for a while. Nowadays, he is an active motivational speaker appearing on the television reality show "I Pity the Fool," a concept that centers around his desire to help and advise people on how to make positive choices.